For more than 23 years, CustomCart shopping cart software has been chosen to provide secure, scalable, and reliable shopping cart functionality to web sites just like yours. Why? Because CustomCart ecommerce software has always delivered completely secure, scalable, and customizable shopping cart solutions for small and medium sized businesses at a fraction of the cost of comparable shopping cart software. CustomCart runs remotely on our high-speed servers and requires only simple HTML forms and links to connect our shopping cart software to your site. Nothing to download or install, just connect to your site and you are ready to start selling online! 100% secure using industry standard 128-bit SSL encryption ensures completely secure checkout and data integrity. Tight security at our data centers helps to ensure that your customers' personal information is safe. Integrates with QuickBooks. Do you use QuickBooks for accounting? If so, you will be happy to know that CustomCart integrates with it using Intuit's web connector software. Using this system, you can set QuickBooks to automatically download orders throughout the day at preset intervals. Extremely customizable. By using your own custom HTML page headers & footers, your own background wallpaper or color, Cascading Style Sheets, and custom templates to affect the look of every page element, you can make your shopping cart look just like the rest of your site. Our tutorial takes you through the process of customizing the shopping experience. Business Intelligence Dashboard. 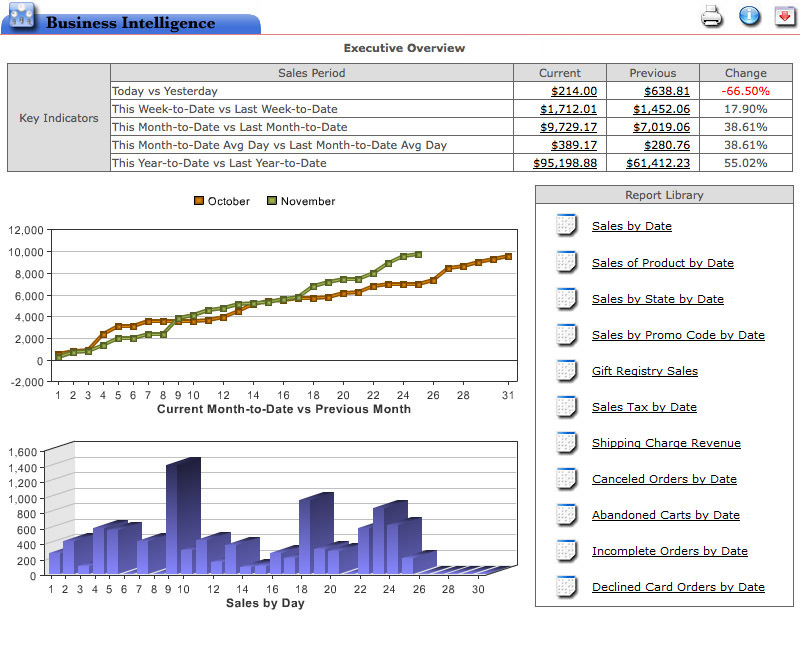 Track your sales in real time using the Business Intelligence Dashboard. Compare daily, week-to-date, month-to-date, and year-to-date sales data at a glance with interactive flash-based graphs and charts. Click for an example of the sort of reporting that comes only with high-end shopping cart software. FREE and unlimited technical assistance means that we are here to help you every step of the way. Whether by phone, email, or Internet Support Request, our expert support team is here to help you get your online store up and running as quickly as possible. Gift registry option. Provide your customers with a powerful, yet easy-to-use gift registry (or wish list) system. Adding this kind of functionality can help to improve word-of-mouth advertising which significantly increases your website traffic and that can have a positive impact on your sales. Simple Administration. Our web-based, icon-driven adminstrator is easy and intuitive to use and includes complete design control of your customers' shopping experience, shipping charge management, full order processing capabilities including partial shipping, order tracking, automated customer emails and more. In other words, you can manage your shopping cart software from any computer anywhere in the world using just a browser. No setup fee. No hidden fees. No transaction charges. Just a flat monthly rate with no setup fee, no per-transaction charges, no additional fees of any kind. One low monthly rate. And there is no charge for your first month of live shopping cart service! 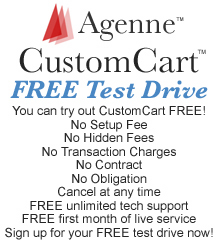 The best way to understand everything that Custom Cart shopping cart software can do is to try it out! Sign up for your FREE open-ended test drive - there is no obligation and you may cancel at any time. The test drive is fully operational with just one limitation - you can only process test transactions through your credit card merchant account. ALL other functions are available and you can try out our ecommerce applications for as long as you like. Sign up today! Copyright 1996-2019, The Agenne Corporation. All Rights Reserved.